No Fireplace or Chimney ? – No Problem ! Project 2 – Alterations and Installation to Large Fireplace & Refurb. This site is updated at regular intervals with information so please look at the Menu for details of installations and what can be achieved when fitting a stove. 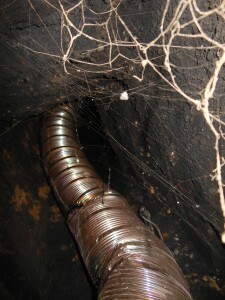 You will see photographs of Installations and also examples of problems. Please visit the Facebook page as this is updated more frequently and feedback suggests that more people view Facebook than Web pages. If you get an answer phone please leave a message, you will get a call back and messages are checked regularly. 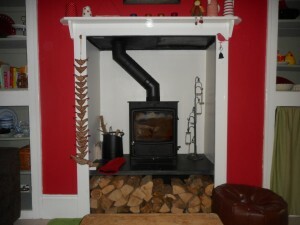 Please remember that a site visit is essential if you are considering having a Log burner fitted. This will be to determine what your requirements are and ensure that any questions you have are answered.It will also be an opportunity to discuss the types of stove that are available and what if any building work is required. Installing a Log burner and associated work is covered by building regulations and is notifiable to the Local Council. HETAS is the government recognised body for Solid Fuel and Biomass appliances,fuels and services and the register of competant Installers. 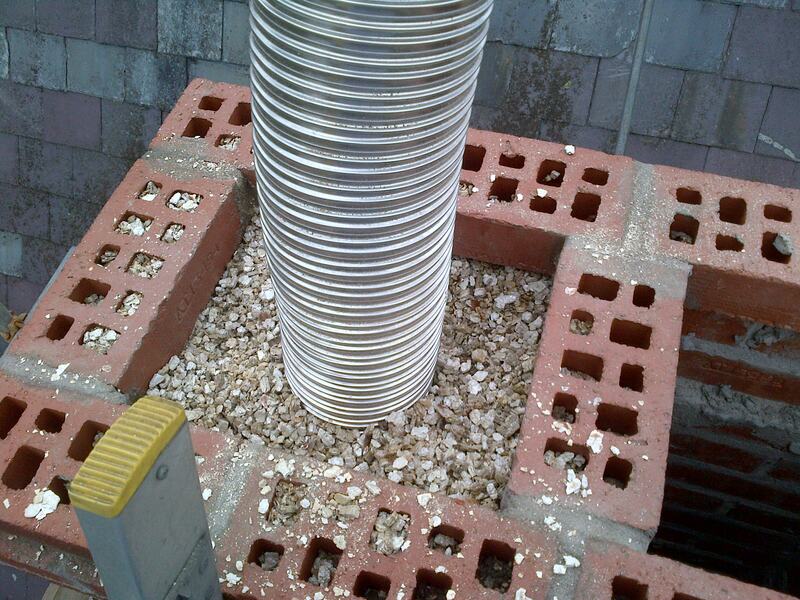 After your Installation is complete you will be issued with a HETAS Certificate of Compliance confirming that the installation is safe and complies to Building Regulations. 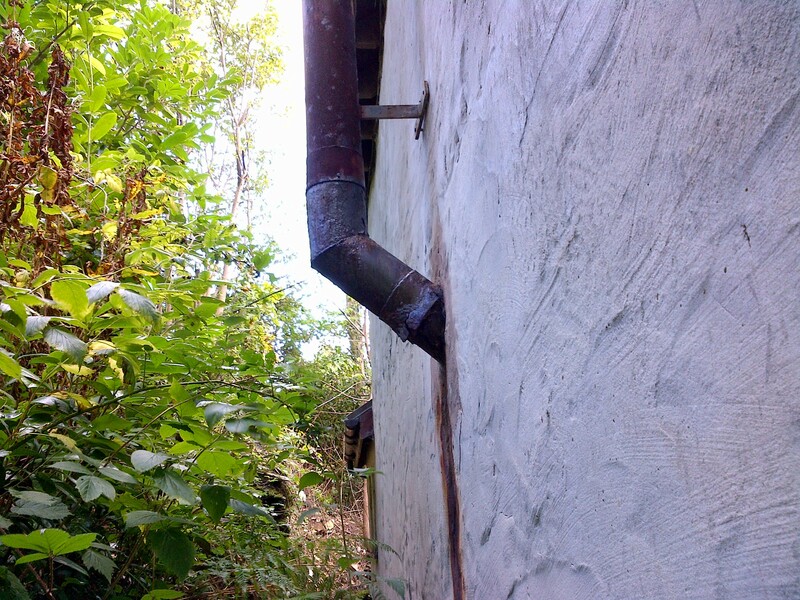 This is essential for Home Insurance and will be requested if you sell the property. 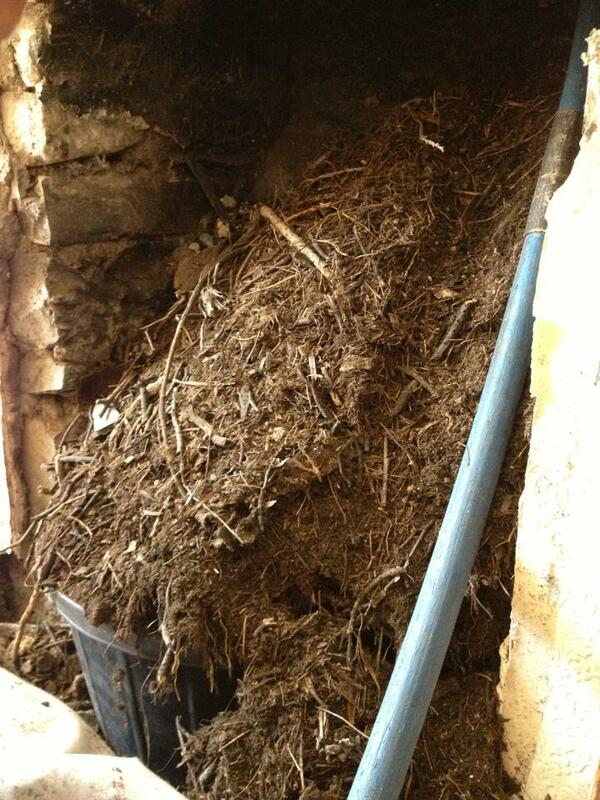 Building Control is infomed at the Council. 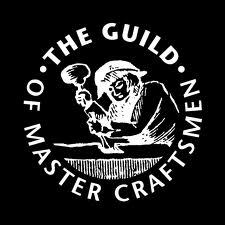 I am a Member of HETAS Reg No 4153 & 16632 and also a member of the Guild of Master Craftsmen. To satisfy all Insurance companies and trade bodies I have £5M of Public Liability Insurance.Copies can be provided on request. 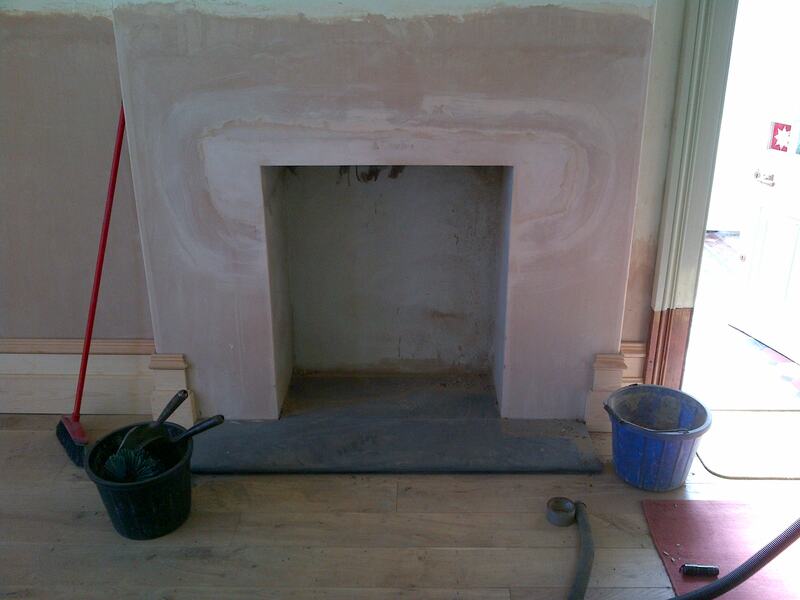 We work with a lot of reliable trades too and often some jobs can be tackled together for cost effectiveness. 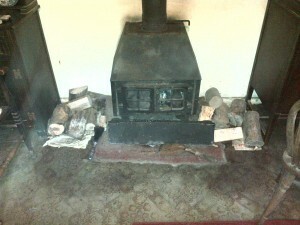 Installation of Log and Multi Fuel Stoves. 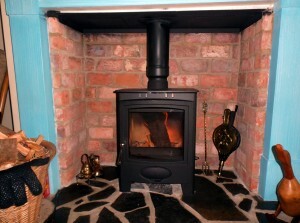 This is a Woodwarm Fireview 9kw Flat top Stove. 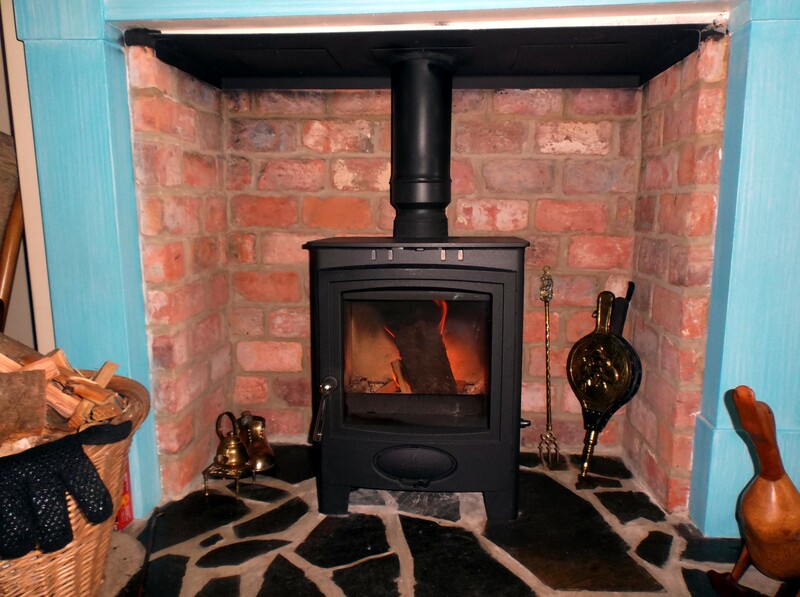 Woodwarm is a very popular Brand and good value.This is fitted into a Inglenook fireplace that was originally a inefficient open fire. Stovax Sheraton after a refurbishment,new glass,rope,collar and given a respray. 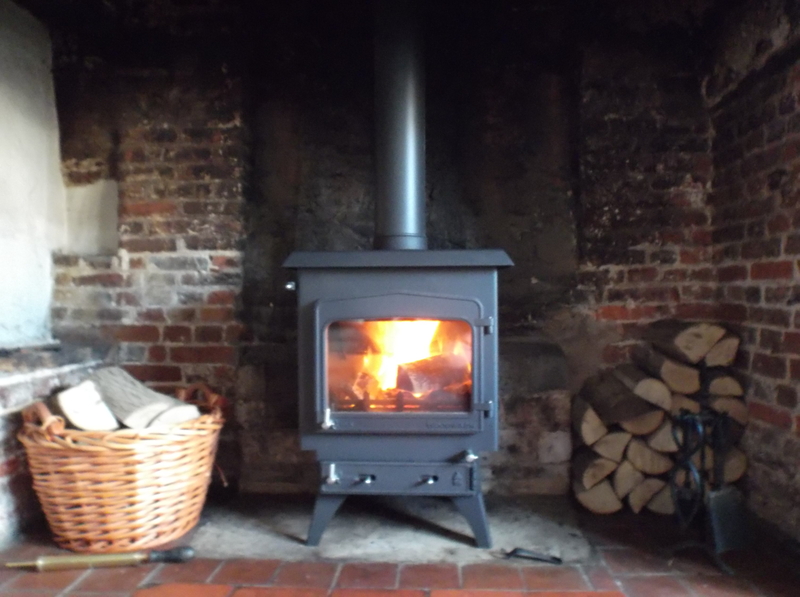 This is the Esse Ironheart The customer wanted a woodburner that she could cook on in addition to the Aga in their Kitchen. This ticked the boxes. 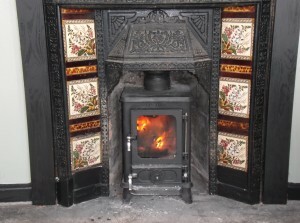 This little stove is a great example of what will fit into a traditional Victorian insert. 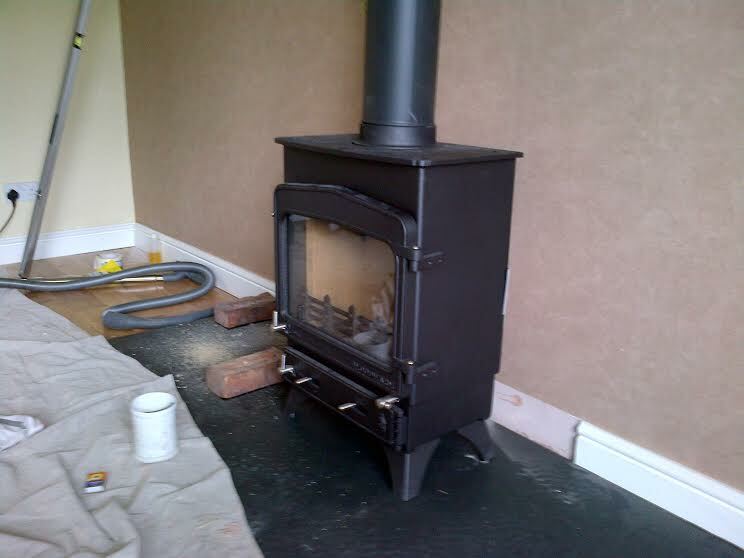 The insert was removed,the back cut off and with some alterations to the fireplace the stove was fitted with a liner.This one produces 4.9kw and is multi fuel. 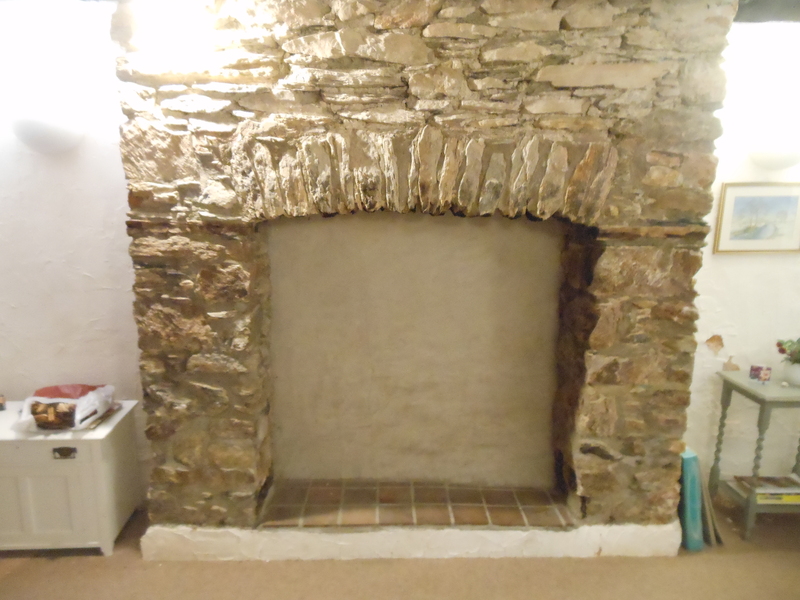 Old render removed from back of fireplace.New slate hearth and shelf installed to create a log store under the stove.Slate facing. 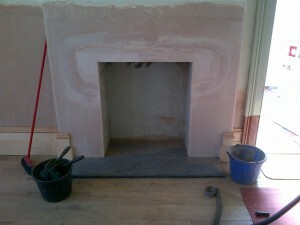 The carpet is being removed and the floor is to be tiled so no combustable materials are close to the stove. First Fire to test for leaks and draw. Perfect.All that remains now is to fill the log store and get a coal scuttle and a companion set. Aarrow Ecoburn5+ A very efficient little stove. 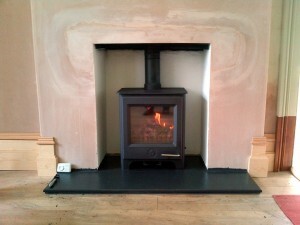 The FDC 5kw Defra approved stove. 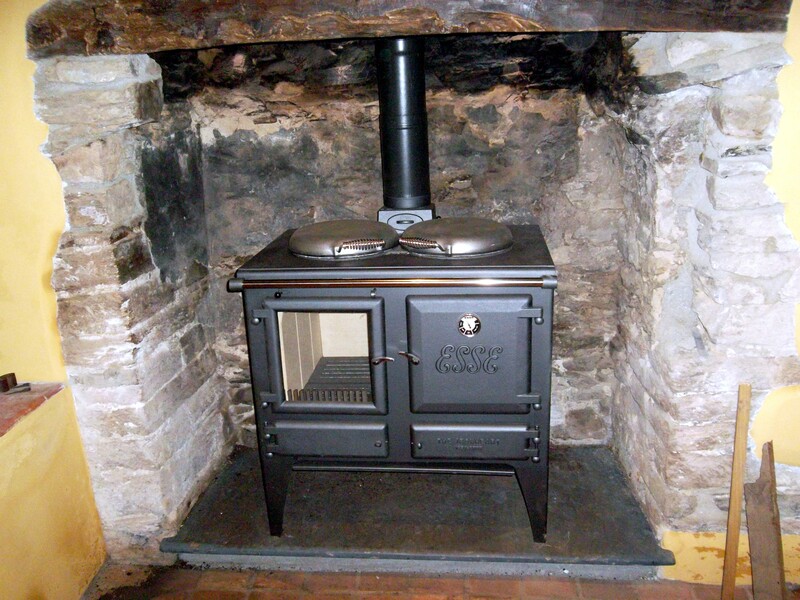 DEFRA approved stoves may be used in Smoke Control Areas. 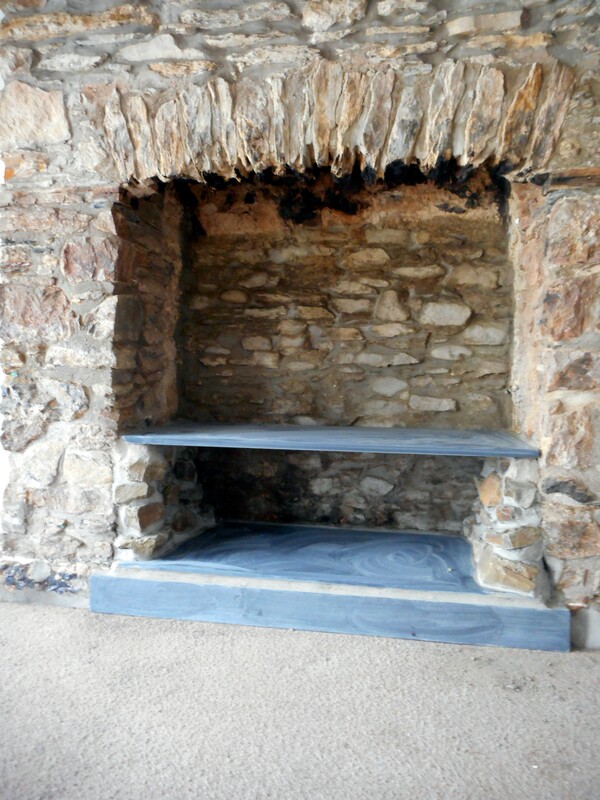 This stove can also be placed on a 12mm hearth.The 25mm slate shelf allowed the safe storage of logs underneath and made good use of a limited space. 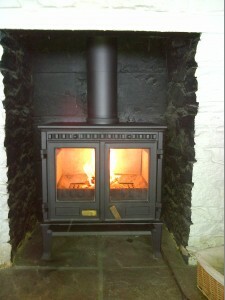 Installed but not finished,Cosmetic work to complete.Woodwarm “Fireblaze” 6kw. 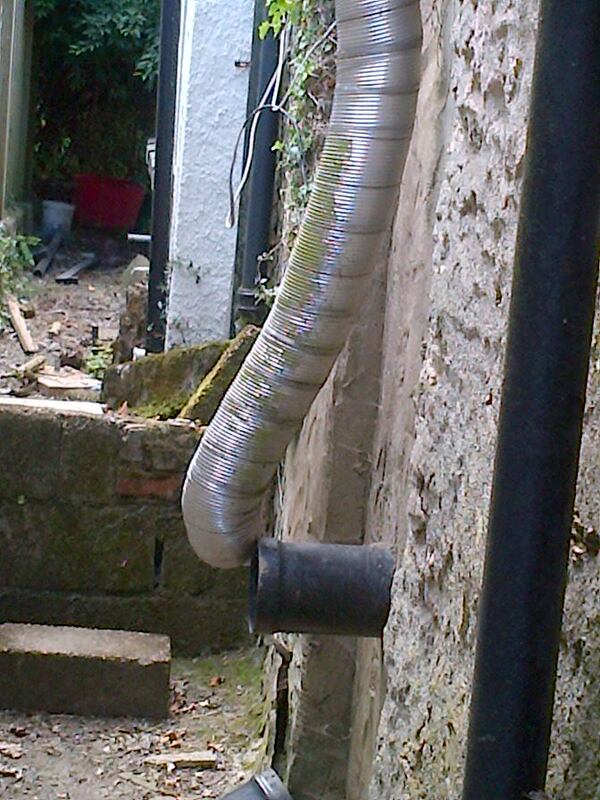 Class One 150mm Flexi Liner insulated with vermeculite. 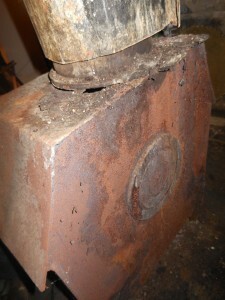 Picture shows top of the chimney before the pot,flaunching and cowl is fitted. The Insulation is recommended but not essential. 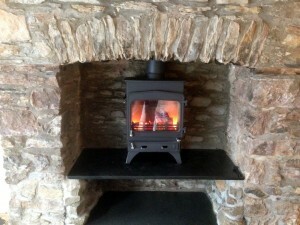 North Devon,West Somerset,Exmoor,North Cornwall. (other areas considered, We have customers in London and Kent too !). 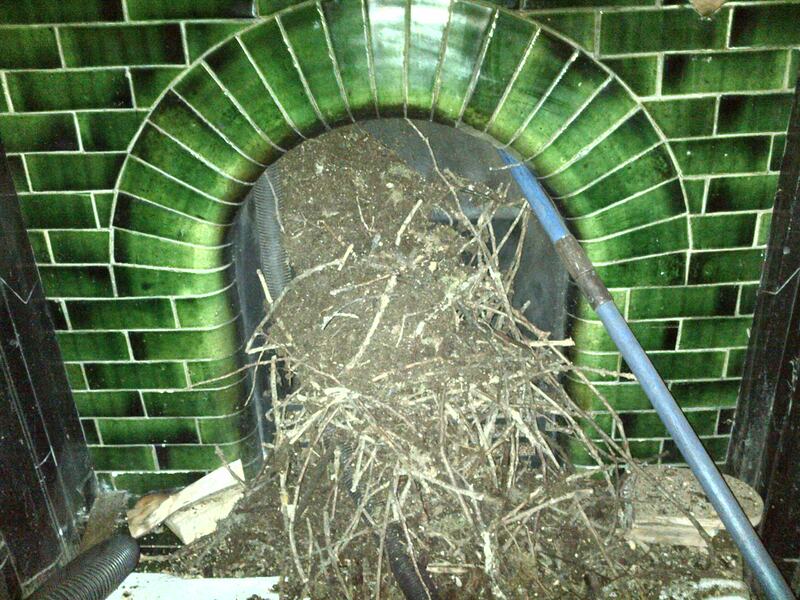 We sweep chimneys, Lined or unlined – All types from Open Fires to Logburners, Rayburns, Agas and Stanleys in all types of properties. We Install Logburning and Multifuel Stoves. To do this a free no obligation visit can be arranged to discuss your needs and explain the benefits of having a stove fitted.Its important that a stove is installed safely and to Current Building Regulations ,so this will all be explained at the time.As a HETAS registered installer you will receive a certificate of compliance when the job is complete.This means that you dont have to inform the local council of the work being undertaken. 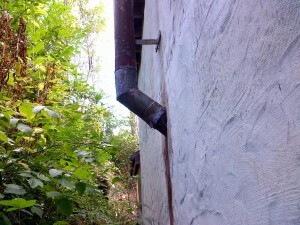 Landlord & Owner Safety Checks. 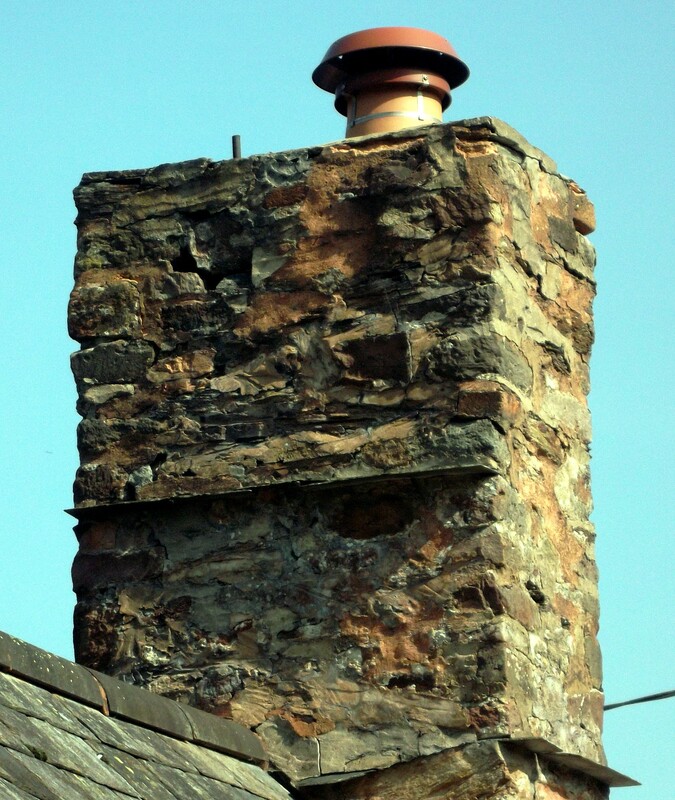 This is a comprehensive check on Solid Fuel appliances,the flue and chimney covering safety and compliance. Broken pot,and flaunching. 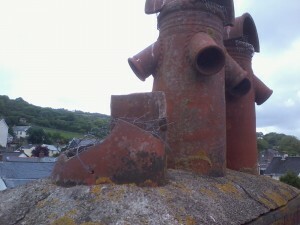 After strong winds the owner of the property noticed bits of broken pot by her back door.These could have easily hit her. Flaunching loose,pots loose and broken and bits of masonry falling into the garden.The working fires have no protection from bird entry either. Top of the pot and the pot broken – someone has attempted a repair with some gutter sealant ! Top layers of loose bricks removed,re repointed.New pots fitted and cowls fitted to working chimneys. 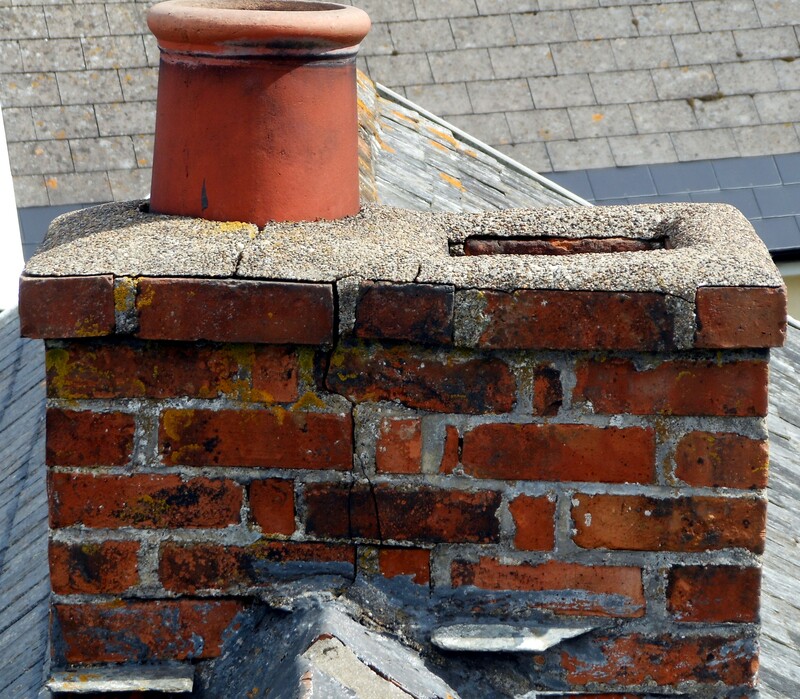 When we inspect the top of your chimney stack we will always take photographs to show you anything that might be a problem not just with the chimney but with the roof,Tv ariel,gutter or anything else, that can be seen.You can then decide what to do,if anything. 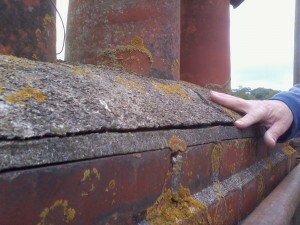 Many of our customers find this useful,after all how often do you actually look at the top of your property ? 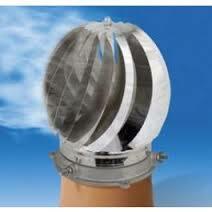 We supply and fit Carbon Monoxide alarms,smoke alarms and Heat detectors (for Kitchens). 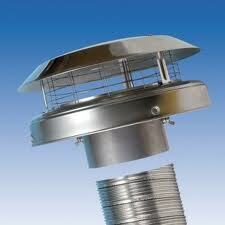 With all installations it is the law that a Co Alarm is fitted within 3m but not closer than 1m to the appliance. 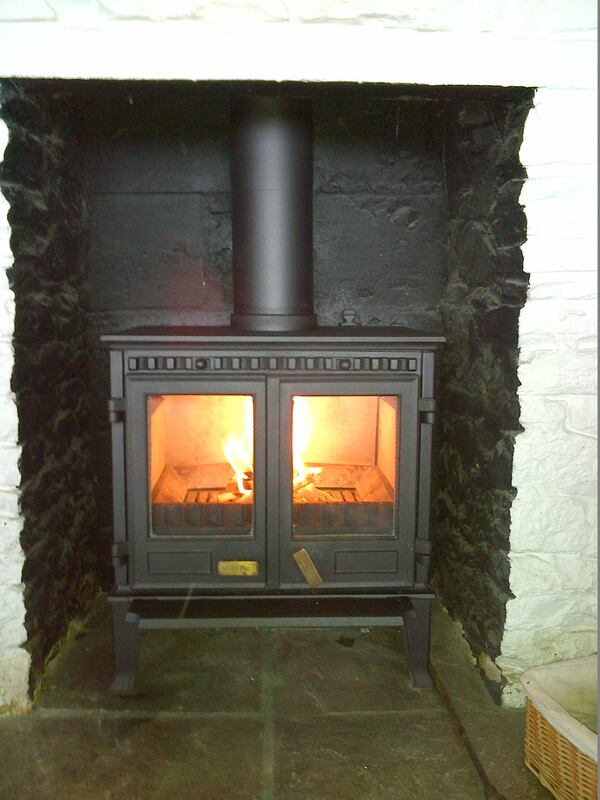 Its sensible to have one fitted near any Gas,Oil or solid fuel burning appliance that you have already fitted. 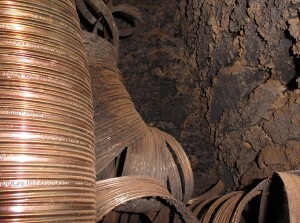 Test them weekly and don’t buy the cheap ones that change colour when Co is detected….You may not be awake to check it. 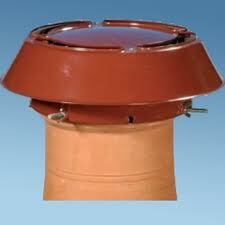 Smoke Alarms should be fitted throughout the house and its a good idea to fit a Heat Detector in the Kitchen. We Install and repair Log Burners and Multi Fuel stoves, replacing everything from Firebricks,Door Glass, and Seals to a full service and respray, if required. 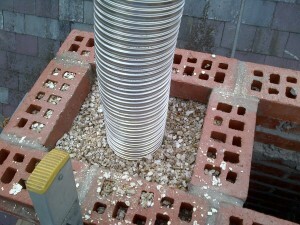 Fitting Cowls and birdguards can solve many issues from poor performance,to downdraught and of course stop birds and pests from getting in your chimney. Please contact us for an estimate or further information. Three examples of Chimney Cowls and a Venting cap.The venting cap is used on disused chimneys.Its designed to allow air into the chimney so it can “breathe” but not rain so dampness should be eliminated. 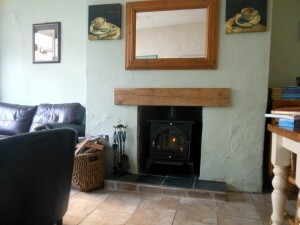 We also work with local builders who have years of experience in Chimney and Fireplace building or rebuilding, opening up dis used fireplaces,roof work and other skills so that a complete package can be offered. Please call Chris on – 01271-855543. 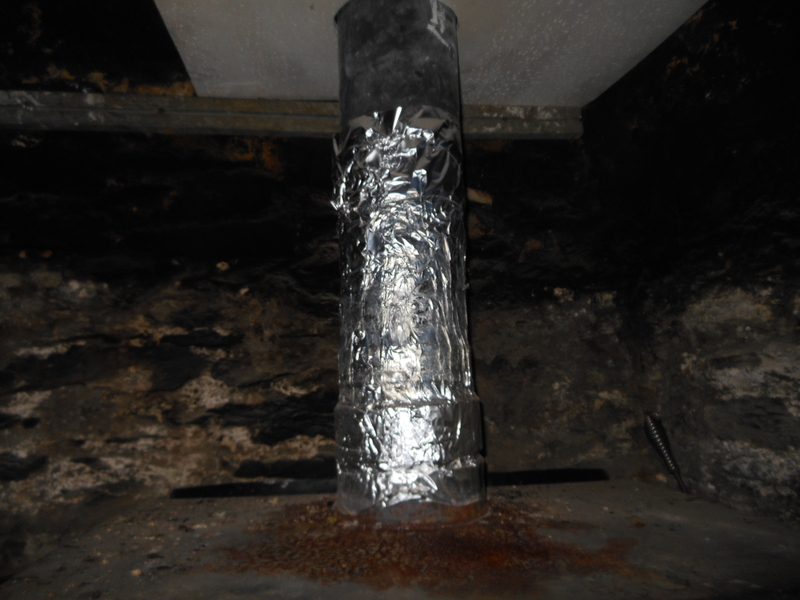 M. 07956-866593. or E mail – phoenixchimneys@hotmail.co.uk If you have any questions or want free advice. 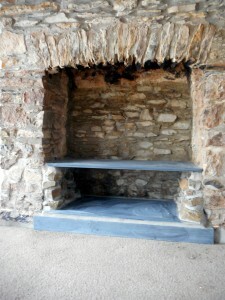 HETAS registered installer and a member of the Guild of Master Craftsmen. And now here are a few Horrors that We have come across…….!! Blocked Chimney – No cowl fitted,full up with 5m high of twigs and birds nests ! Another house,another Chimney,but the same problem. 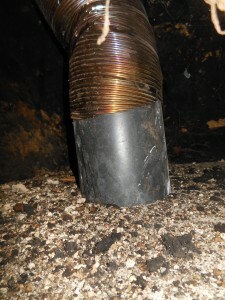 A Gas liner installed on a woodburner. which has collapsed. 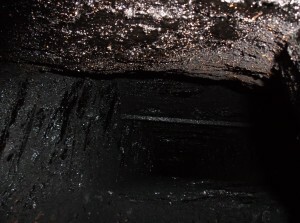 Fumes were entering the room and the chimney had caught fire . Highly dangerous. Probably one of the worst ! 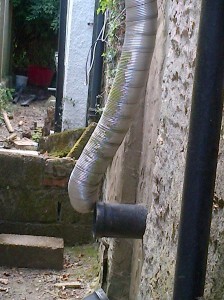 All the wrong materials and nothing is fitted, a piece of garden twine ties the top to the gutter ! 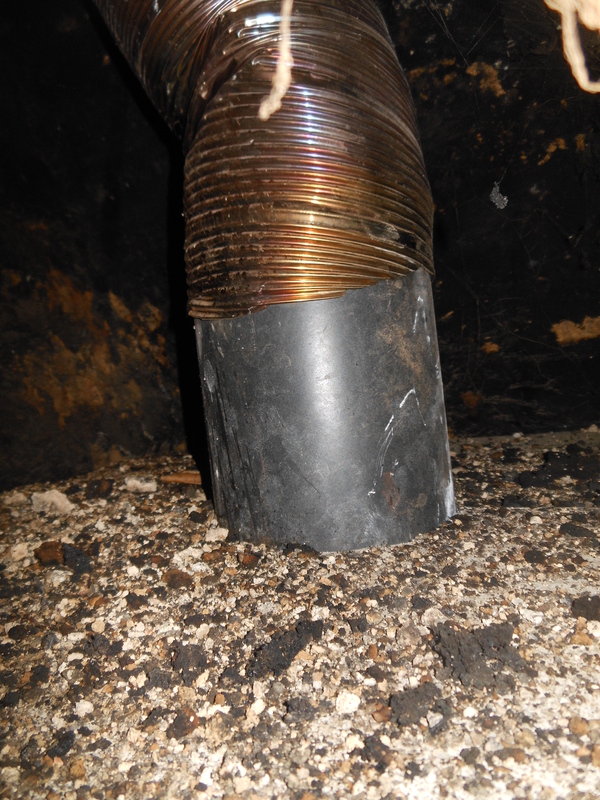 This liner was incorrectly fitted fell apart ,collapsed and blocked the chimney. 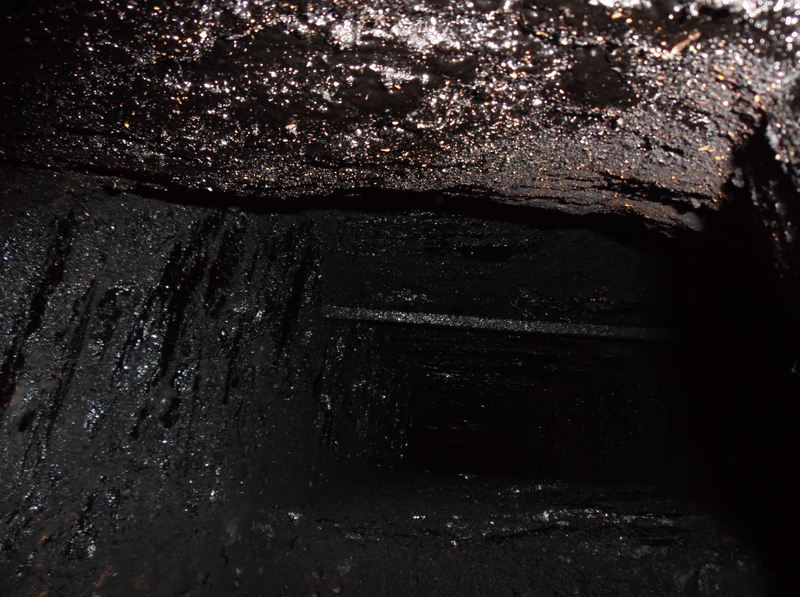 This liner was fitted incorrectly and just left sticking out the top of the chimney ! 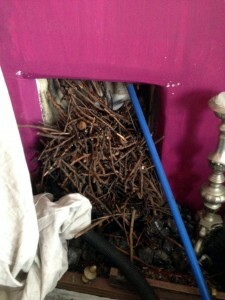 It was next to a Tv ariel and both were struck by lightening ! 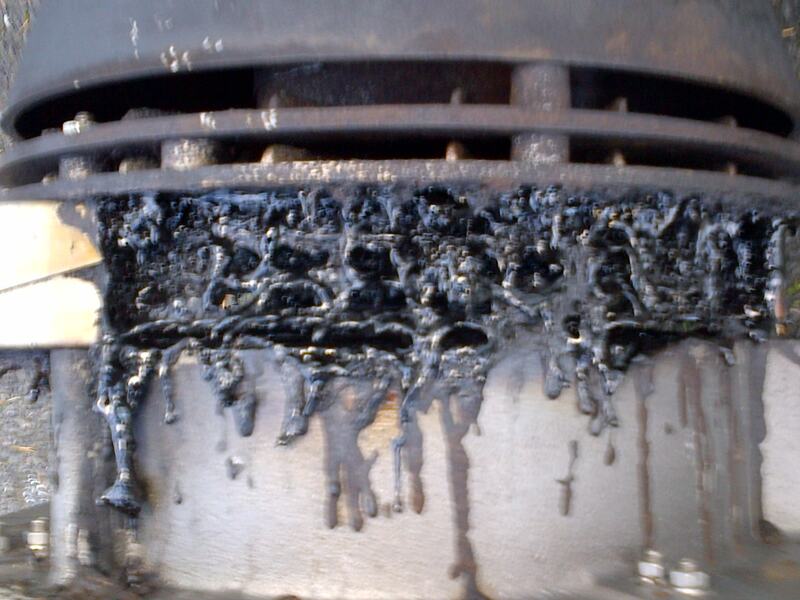 Customer advised not to use the stove or the chimney. 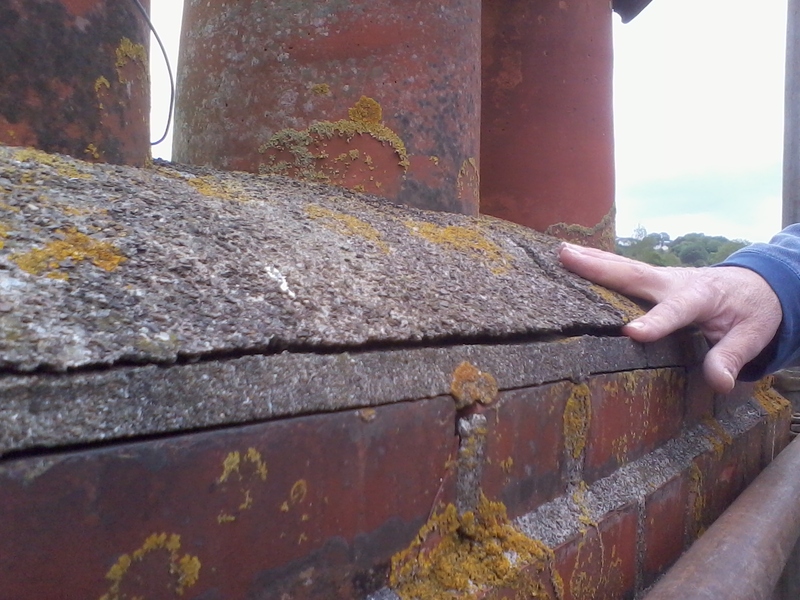 A few gaps in this stack letting in the elements. This customer told me that his chimney was “insulated”. He put this around the flue to stop the tar dripping onto the stove ! 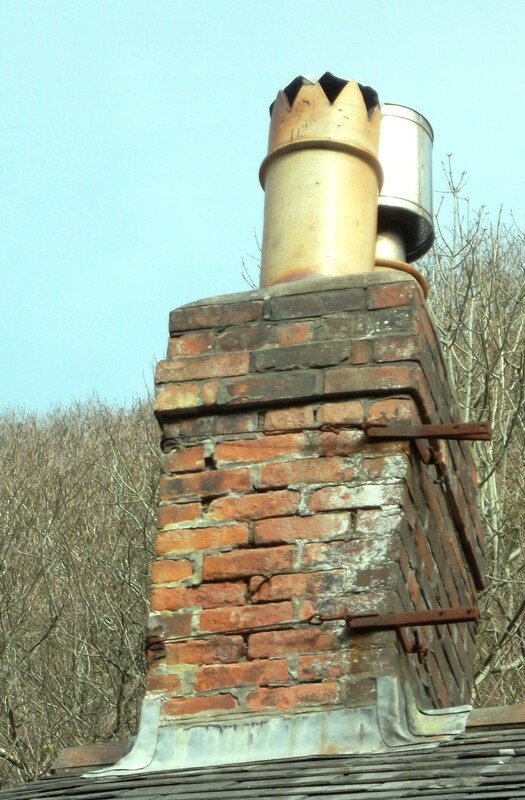 Needless to say I advised him to stop using the appliance and chimney. 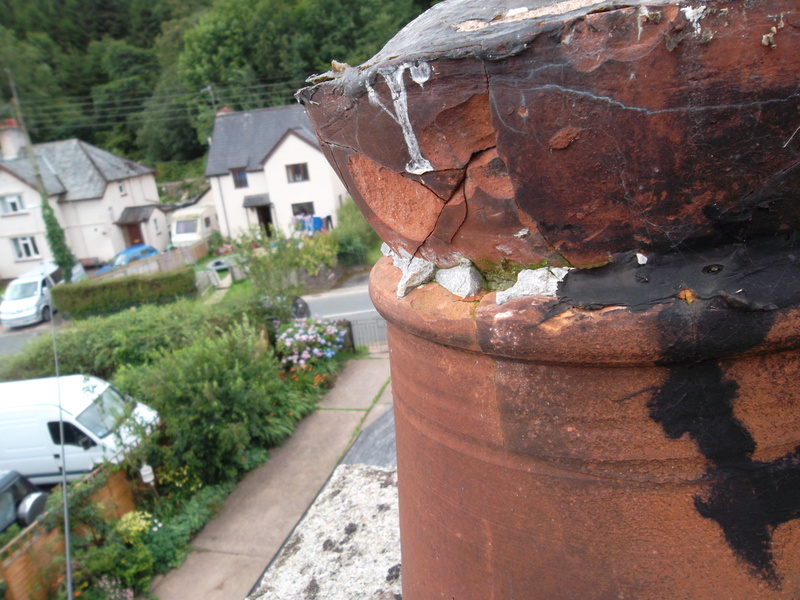 Tarred up chimney.This is a fire risk.The only solution is to line it. 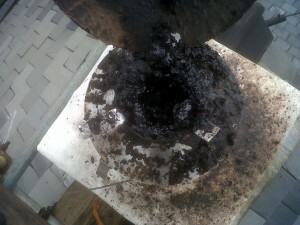 View from the top of the chimney.This cowl was totally blocked with tar caused by the burning of unseasoned wood. 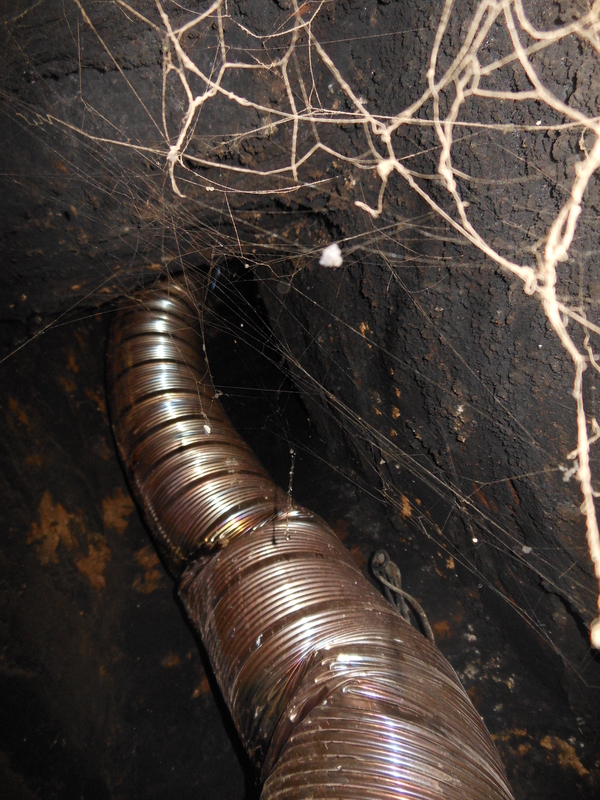 Wood should be dried for at least 18months and have a moisture content of less than 20%. 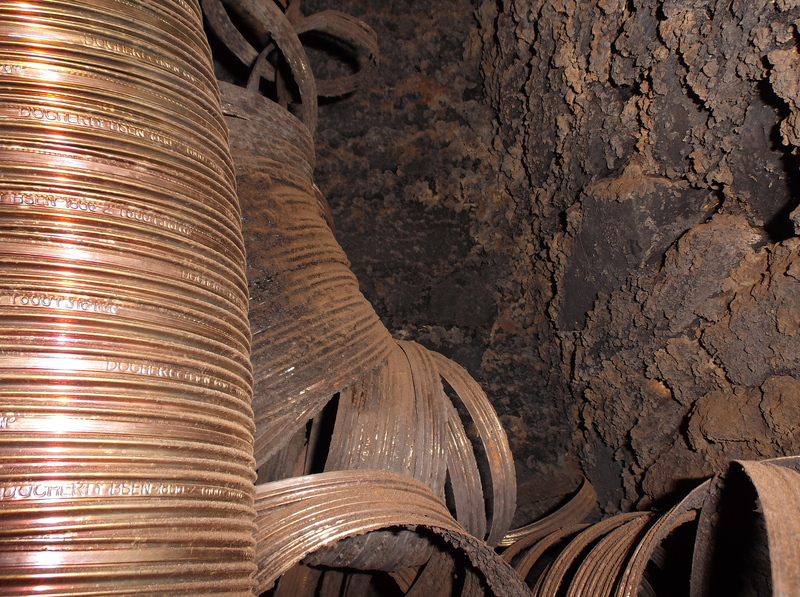 The owner of this property was unaware of what caused this but she did have a Carbon Monoxide alarm that activated and alerted her to the problem. 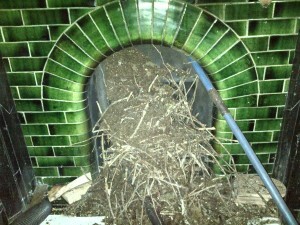 I was asked to repair this stove by a Landlord,whose tenant had this and an electric fire as the only source of heating. The stove was non repairable but the stack and fireplace was worse. A complete rebuild would be needed. I hope she took the advice ! 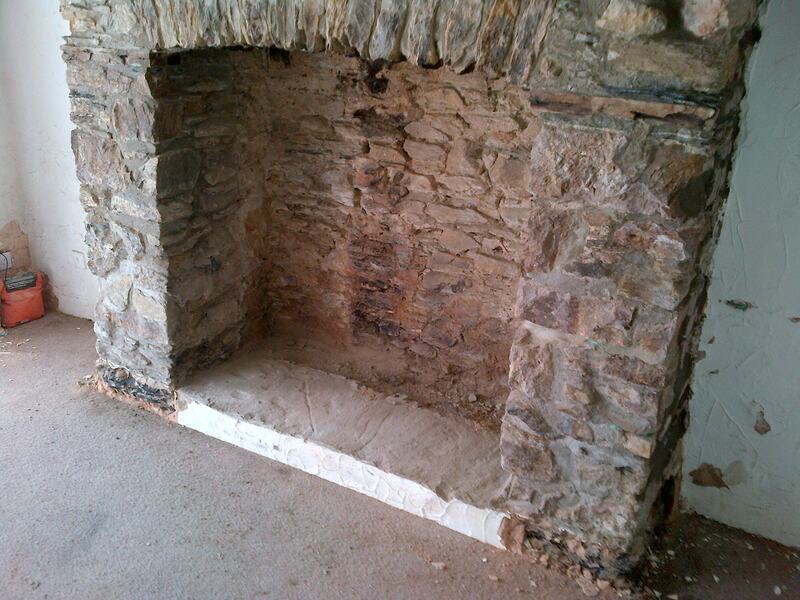 This is a Gas Fire – A blocked Gas fire .Gas Fires should be serviced and only by a Gas Safe registered fitter. 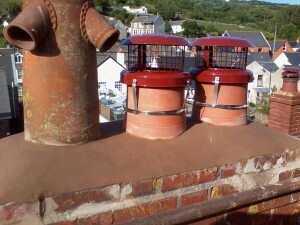 More Tarry Cowls, this time an electric one that was not being serviced.